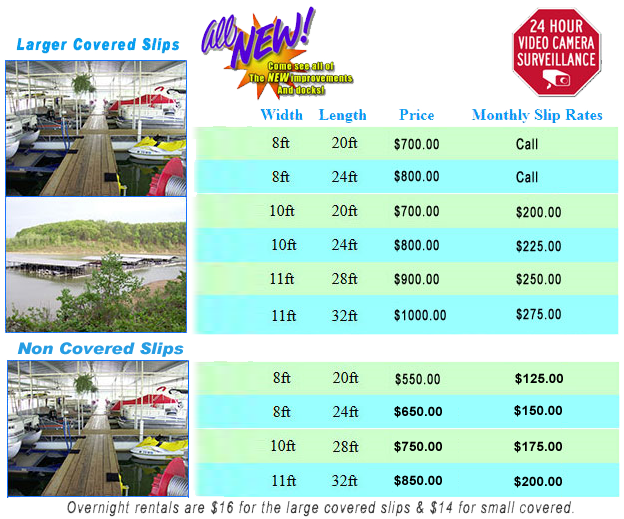 Webb Creek Marina offers a plethora of slip sizes at affordable rates! Webb Creek Marina has 15’, 18’, 20’, 24’, 28’, and 32’ slips. All of our slips have 4’ walkways that make access and loading incredibly easy and convenient. The docks are constructed of sturdy galvanized steel and treated wood decking. All of our slips are serviced by lighting and have electrical outlets at each slip. Additionally, Webb Creek Marina’s slips are under 24 hour security monitoring. An improvement that is particularly exciting, this year all of Webb Creek Marina’s slips are serviced by High-Tech Service Pest Control and Home Watch. High-Tech is a company that uses an all-natural, Corps of Engineers approved formula that eliminates all spider webs. Contrary to what our name suggests, Webb, Webb Creek strives to offer slips that are free from all spiders, bugs, birds, and other pesky animals making your boat less that immaculately clean at all times. All of our docks have already had several treatments and it has become nearly impossible to find a spider web. Yes, that is right, Webb Creek offers a slip rental experience that is free from the headache that is spider webs! Call 573-461-2344 today to reserve your spot in one of these ideal and affordable slips. Price's reflected throughout the site may not be accurate. Copyright © 2019 Webb Creek Marina. All Rights Reserved.